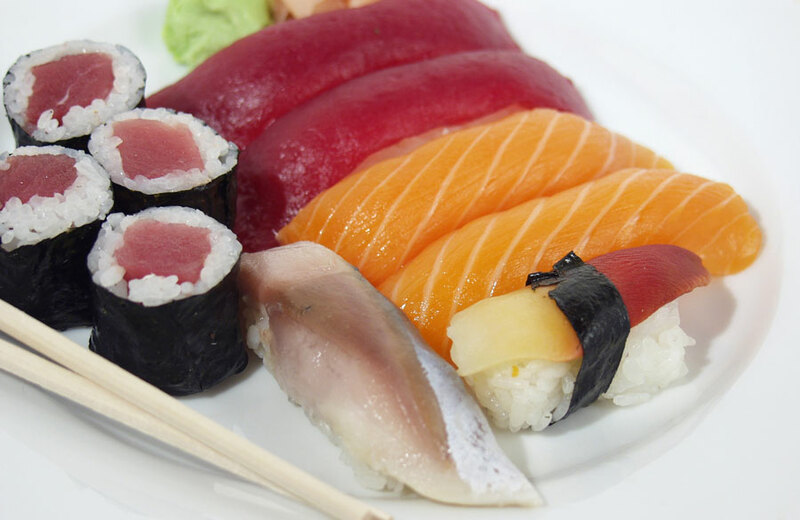 New York City will now face a new rule when it comes to serving raw fish. The New York Times reports, regardless of how fresh the fish is, restaurants must freeze it for an extended period of time in order to prevent bacteria and parasites. While most places are already doing this as a precaution, the process is now law. Outbreaks of salmonella have caused major concerns in the past few years. The new rule will put those fears to ease among consumers who enjoy eating raw fish. Starting in August, fish must be kept frozen anywhere from 15 hours to an entire week depending on the restaurants’ freezer temperature. Certain seafoods like shellfish and farm-raised fish, however, are exempt from the freezing laws. Harris Salat’s downtown Brooklyn ramen-ya makes a lovely broth with chicken bones, then makes it even lovelier with a float of house-made chile oil. It comes with wood ear mushrooms, seasonal greens, garlic chives and scallions. The intensity of Ivan Orkin’s Gotham West Market mazemen–the thin, frizzy noodles are dressed in a little broth plus mashed roasted garlic, chicken and pork fat–is almost (almost!) too much to bear. Shuichi Kotani’s springy noodles might steal the show if it weren’t for the wonderfully creamy pork-bone broth, spiked with an umami-rich chile-garlic paste, and wobbly chashu. Sure, a lot of great ramen shops have opened since we first fell for Minca, but this tiny LES spot still has its charms, among them the deeply garlicky broth, excellent pork belly with tender fat and totally unfussy counter service. Inspired by instant, but infinitely better, Hooni Kim’s late-night special involves a rich broth made with fish, chicken and pork bones and stained with chiles, plus excellent noodles coming in from New Jersey. Count on this Japanese chain for some of the most reliably delicious bowls (and longest lines) in the city. The Akamaru’s incredibly creamy, fatty tonkotsu broth has a secret: a scoop of deep red miso that slowly melts away. Takashi Inoue is a serious beef-offal enthusiast, so it’s no surprise that his excellent broth is made from beef bones–simmered for 24 hours with aromatics, sticky with collagen–and topped with fried small intestines and beef belly. In ramen, as in love and war, everything is fair game. Even this sweet-savory, deeply satisfying bowl featuring halved okra and fried garlic, a pork broth thickened with coconut milk and bright with green curry paste. This little counter in Hell’s Kitchen still makes one of the best (and cheapest!) bowls in town: a rich chicken broth, excellent house-made noodles and great toppings including chashu that’s torched before your eyes. Seasonal vegetables in a deep bowl of kombu-dashi broth seasoned with miso and garlic-scallion oil, plus a pile of lovely noodles, make this veggie ramen nearly as rich and just as satisfying as its meaty brethren.